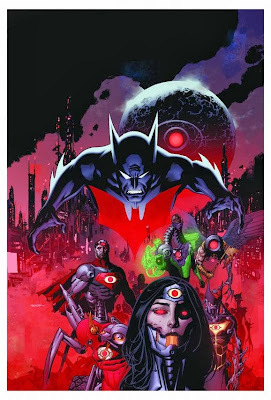 Just yesterday I was talking about DC having to come out swinging with it's plans for a 2014 post Forever Evil, and low and behold, the next day they drop a bomb blast in the form of another weekly series, one officially bringing Batman Beyond into the DC52. The New 52: Future's End debuts with a zero issue on the first Saturday in May, aka Free Comic Book Day. A huge profile for a new title, the weekly book that aims to cover what it means to be a hero by having past, present and future collide, will take a few beats from the publisher's original modern-day weekly series, 52. Batman Beyond, Firestorm and Frankenstein will lead the book in true 52 style, along with new characters and concepts thrown in alongside. From Ryan Sook's incredible cover of Brother Eye, it's a fair call that the troublesome satellite will also get it's licks in too. 52's layout artist Keith Giffen is one of four writers forming the title's 'brain trust', with Jeff Lemire, Dan Jurgens and Brian Azzarello filling the remaining seats. That's the hit-maker right there. There's not a weak link in that chain - four distinctive and talented writing styles. Hey Shag! I wonder if he'll be the character Dan takes through? I'm sure he had more story to tell with the character. Maybe this will be where those ideas see light? I sure hope so! Fingers-crossed!